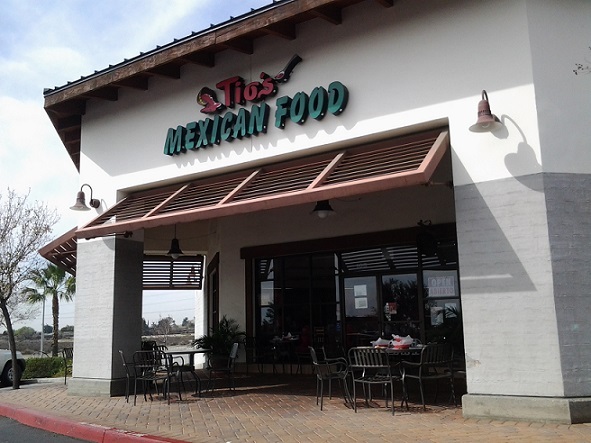 A small chain of family-owned Mexican restaurants, Tio’s has two locations in Rancho Cucamonga (10451 Lemon Ave. and the Day Creek location above), one in Riverside and one in Fontana, the latter of which I wrote about in 2011. 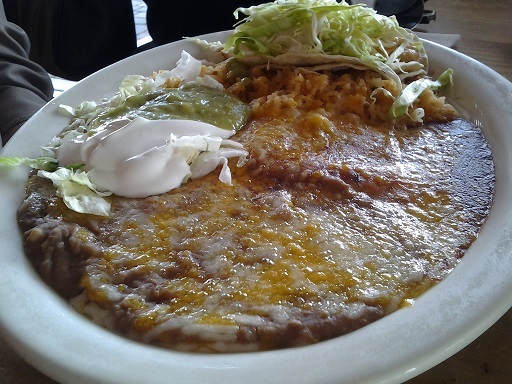 I’ve visited the Day Creek Tio’s once or twice in the past but never wrote about it. I was pleased when some friends wanted to meet up for lunch there. 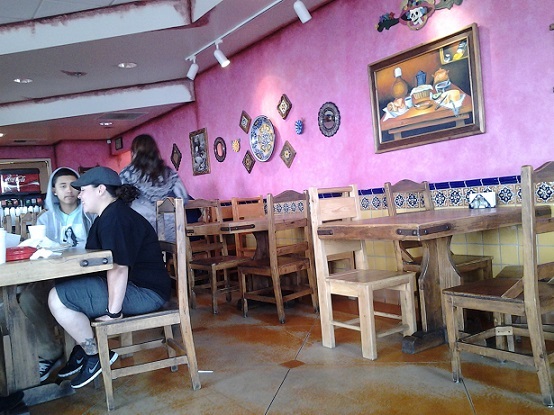 Like the other Tio’s, the decor incorporates folk art and colored tile, making for a nice visual experience, and has the sort of seating you’d expect at a sitdown restaurant. Among the decorative objects on the walls are photos of Cantinflas, one of Mexico’s greatest exports. We ordered at the counter — you can see the menu here — and the food was delivered to us. (I got a large horchata for $1.75, the result rivaling an oil tanker in size.) Three of us were given baskets of chips. We did not lack for chips. Good ones, too, and with a salsa bar. 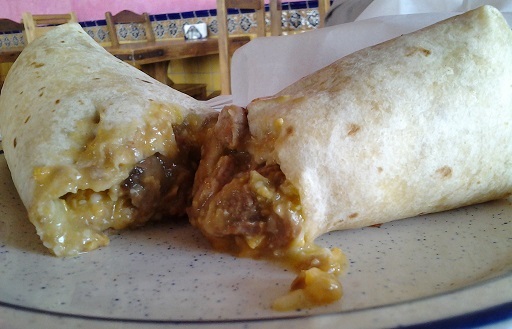 I had a chile verde burrito ($4.99, bottom), which was really good and really filling. A vegetarian had potato tacos ($2.09 each; “tasty salsa”); one had a combo plate with a cheese enchilada and a fish taco ($7.39, below; “I thought it was fantastic”); the fourth had the Mexican chicken salad ($5; large but “very generic, soggy”). He added that he’d been to Tio’s before and would return. Me too. After lunchtime conversation came to a close, your burrito-infused blogger went home, took a nap and didn’t need to eat again the rest of the day. This entry was posted in Restaurants: Rancho Cucamonga by David Allen. Bookmark the permalink. Would have been great, IF I COULD FIND IT!!! Called the location in Fontana and the girl didn’t know it existed. Off to Chronic Tacos I went! Hey, I gave the address and the cross street, and there’s only one commercial development on that corner. Should I have left a trail of tortilla chips? Maybe so! I went to the Day Creek locaiton. It’s kind of crowded around there. Your review had me craving, but I was on a tight schedule for lunch. When I got back to the office, I found a suite number online. That should help me the next time I head that way. I hope it’s better than Chronic! Correction!!! I was on Day Creek at Foothill!! My mistake. Now I’m truly excited, as it’s right by my house!! !